Add a rosy hue to one of summer’s favorite cocktails with these delicious Bubbly Strawberry Rosé Mojitos. Makes an easy batch cocktail for groups, too! Though summer and warm weather may take a few more weeks to fully arrive in Minnesota, I’m ready to toast the season with our refreshing recipe for Bubbly Strawberry Rosé Mojitos anytime. 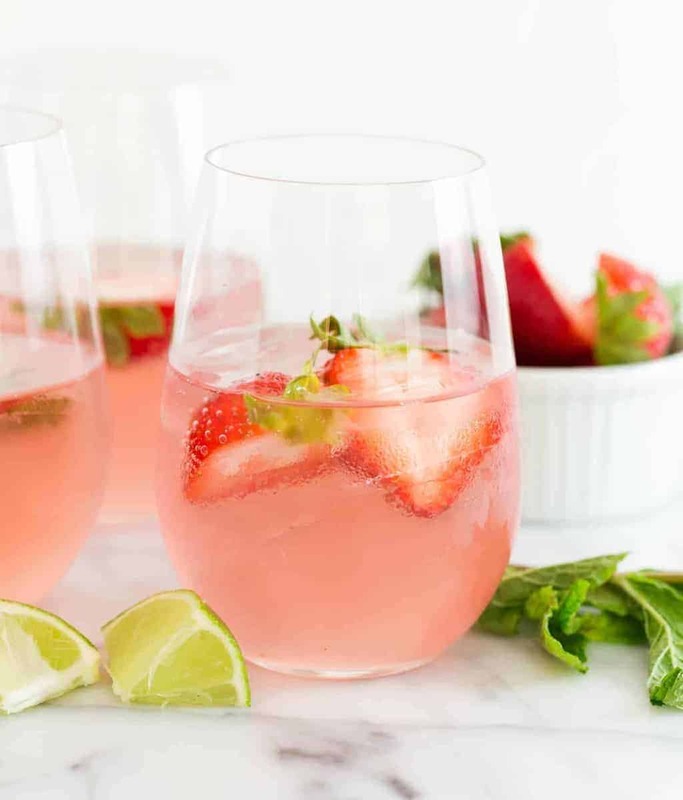 Mojitos are a summer cocktail staple everywhere, but the addition of sparkling rosé wine and juicy ripe strawberries gives this seasonal cocktail a fresh new twist. 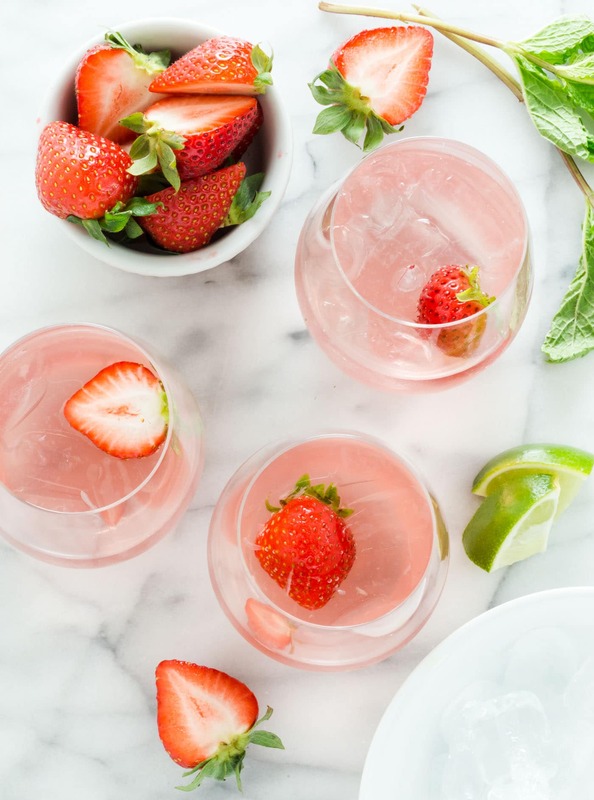 A signature batch cocktail can make hosting your party so much easier, and we highly recommend a pitcher (or two) of these Bubbly Strawberry Rosé Mojitos for your next BBQ or backyard potluck. Although there is a misconception that all pink drinks are super sweet, this cocktail has a nice balance of sweetness, tang and freshness. Just make sure you muddle the limes, mint and simple syrup well to release their juices and oils. A long handled muddler like this one works well for this task since you need to muddle the ingredients in a large pitcher which is usually pretty tall. Tip: This recipe for Bubbly Strawberry Rosé Mojitos also makes a lovely brunch cocktail. Simply make the recipe through step 1 and evenly divide the chilled rum mixture among champagne flutes. Top with sparkling rosé and float a strawberry for garnish. The rosé wine rests on the rum for an impressive ombre look in the glass. Festive! Welcome summer in style with a pitcher of these Bubbly Strawberry Rosé Mojitos! Click on our recipe video below and watch just how easy these tasty cocktails are to make for your next party. Cheers! You can never have too many mojito recipes! Place simple syrup, mint leaves and limes in a large pitcher and muddle well. Stir in the rum. Pour the wine into the pitcher and gently stir to combine. Pour mojitos into ice-filled glasses and garnish with strawberries and additional mint leaves, if desired. To make the simple syrup, combine 3/4 cup sugar and 3/4 cup water in a small saucepan. Cook over medium heat until the sugar has dissolved, stirring occasionally. Allow to cool to room temperature and store in the fridge until ready to use. Check out more spring sippers on our Cocktails and Drinks Pinterest Board! Ur killin’ me Smalls! Two of my faves strawberries and mojitos all in one! Can’t wait to give this a try. Perfect!!! My market has already brought out the strawberries! I would love it if you link up to Tipsy Tuesday at Grey is the New Black! I’m soooo ready for berry season!! So, why do you make simple syrup for the mojitos when it never tells you to use it? Is it just for looking at? Hi Chris, you muddle the mint leaves and limes with the simple syrup before you add the rum. Hope that helps! If I muddle the syrup, lime & mint in a pitcher with a strainer at the spout, can I leave the mint & limes in the mojito mix overnight. Is there a reason to strain it? Will the flavor be too strong? Hi Diana, you definitely do run the risk of “overinfusing” the mix, but I don’t think it’s something that a little extra sparkling wine couldn’t fix. If you try it, please stop back and let us know how it turned out! Sounds absolutely delicious! Love that you used rose wine! Can’t wait to give these a try for New Year’s Eve! Sounds like a tasty way to ring in the New Year to me. Cheers, Michelle! This is MY kind of cocktail! So elegant and not overly alcoholic :). How many glasses does this recipe make? Hi SJ- This recipe will fill 12 champagne flutes. Cheers!